If you experience symptoms ranging from gastrointestinal problems to migraine headaches, you may have an intolerance for gluten, one of the primary proteins in wheat and other grains. Unlike a wheat allergy, which causes immediate and sudden symptoms and is easier to diagnose, gluten intolerance can cause delayed symptoms and remain undiagnosed for years. Understanding the symptoms can help you decide whether you should speak to your doctor about this issue. Although the medical community once doubted the existence of gluten sensitivity, also known as "wheat intolerance," a growing body of evidences suggests that this type of food intolerance is a real issue for some people. According to WebMD, people with gluten intolerance can experience a number of symptoms, but they often test negative for Celiac disease or an all-out wheat allergy. The primary difference is that gluten intolerance doesn't produce an immune reaction in the body. Instead, diagnosis is usually based on the following common symptoms. 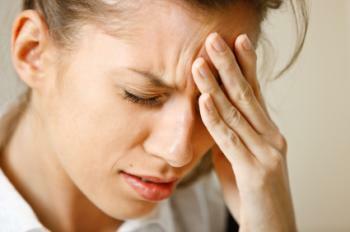 Feeling sick to your stomach can often be a symptom of gluten intolerance, according to WheatIntolerance.org. You may notice that you're nauseated after meals or throughout the day, and you may even vomit occasionally. Many people with gluten sensitivity report that they experience symptoms that are very similar to Irritable Bowel Syndrome (IBS). These symptoms include frequent bouts of diarrhea, sometimes alternating with constipation. Abdominal cramping and bloating are also a part of the condition. A review of literature published in The American Journal of Gastroenterology reports that these symptoms may be nearly as severe as those with full-blown Celiac disease but are much harder to diagnosis. According to the Daily Mail, joint pain is another common symptom of gluten intolerance. Many people with a sensitivity to wheat and other grains complain of stiffness and pain in their hands, knees, wrists, and elbows. This pain may come and go, depending on whether the person is currently reacting to gluten. According to an important study about the symptoms of gluten intolerance published in the journal BMC Medicine, some people who are sensitive to wheat also experience unexplained weight loss. If you are losing weight without trying to, this can be a sign of a more serious condition. It's important to discuss this symptom with your doctor right away. Long-lasting and extreme fatigue is another notable symptom of gluten sensitivity, according to the BMC Medicine study. In fact, the study found that about a third of patients with gluten or wheat intolerance experienced this symptom. BetterHealthUSA reports that gluten intolerance can also trigger migraine headaches, and this is a symptom that many wheat-sensitive individuals report. Migraines may come on hours or even a day or two after the person consumes wheat, so it can be difficult to link this symptom with the food intolerance. According to the BMC Medicine study, 35% of patients experience this symptom. If you're noticing that your hands, arms, or legs are numb for no reason, this may also be a sign of gluten sensitivity according to the BMC Medicine study. About 20% of gluten-sensitive patients may experience this numbness. Feeling "foggy" or having difficulty concentrating on mental tasks is another notable gluten sensitivity symptom. The BMC Medicine study reported that more than a third of patients experienced fogginess and difficulty thinking clearly. Another notable symptom according to the BMC Medicine study was depression. As many as one in five gluten-sensitive individuals may experience extended periods of feeling hopeless, listless, and down. A rash called dermatitis herpetiformis is another symptom of gluten sensitivity, according to Dermatology Online Journal. Characterized by intensely itchy bumps and blisters, the condition usually occurs at the scalp, knees, elbows, back, and buttocks of affected individuals. Often, patients with this rash don't exhibit the intestinal symptoms of gluten intolerance, but a gluten-free diet can help clear up the condition. According to a study funded by the University of Hawaii, gluten intolerance may be increasing in the general population. If you suspect you have a wheat or gluten intolerance, you should speak with your doctor about eliminating wheat products and other gluten-containing foods from your diet. After several weeks of not eating wheat, you may find that your symptoms have improved. If your symptoms have not improved, your doctor can help you determine what may be causing them. After speaking with your doctor, you may choose to eliminate gluten from your diet. There are many great foods that don't contain gluten or wheat, so you'll have plenty of options. Try out the diet for a period of four weeks or as recommended by your doctor. At the end of that period, you may find that your gluten intolerance symptoms are gone!